These days we are faced with two competing imperatives – the need to reduce the volume of food wasted every day and the need to stop the depletion of natural resources as result of inefficient waste disposal. Both problems produce their fair share of environmental, social, and financial issues that have yet to be solved. Big Data analytics tied to accurate quantification of solid waste may be the solution for countering food waste and transforming the clumsy energy-laden logistics of waste management. The historically growing waste industry generates nearly $55 Billion in annual revenue, of which, approximately $16 Billion is derived from the transportation and disposal of the organic fraction of waste. 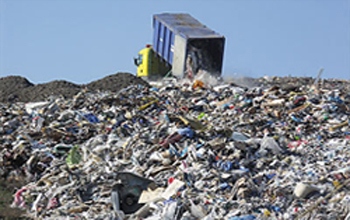 The waste industry has long relied on antiquated, inefficient, and complicated technology strategies such as landfilling and composting as solutions. Delivering a scalable and low-cost solution that offers share holder value alongside positive environmental results is easy if you consider BioHitech America’s unique solution to food waste which combines green technology with the power of big data to offer transparency, savings, and a safer and sustainable future. The company’s Eco-Safe Digester Solution, an on-site aerobic digester, eliminates up to 2,400 pounds of food waste in a 24-hour period and is designed to digest a wide range of food types such as fruit, vegetables, meats, poultry, fish an dairy leaving nothing to store or transport. The Eco-Safe Digester then converts food waste into nutrient-neutral water and transports the water safely through standard sewer lines. Managing food waste on-site not only diverts significant volumes of waste from trucks and landfills but also has the ability to increase the awareness of the volumes wasted in order to prevent waste altogether. What makes the solution superior to other on-site waste removal devices is that each unit is equipped with an on board scale that weighs food waste each time it is added, determining where, when, and what food waste is being disposed. The BioHitech Cloud, a technology platform hosted by Amazon, measures key metrics to optimize the food waste disposal process. These metrics are providing the industry with an unprecedented level of transparency that not only helps to reduce the amount of waste generated, but improves company-wide efficiency and profitability. The uniform reporting and comparative analytics provides an accurate audit trail to support environmental directives that tracks savings and utilization while highlighting successes and uncovering anomalies. Organizing and preparing reports is easy and can be designed for single or multiple locations, by geographical areas, by management structure or by season. Reports are also easy to access and can be done from several devices including computers, tablets, and smartphones. BioHitech America currently provides its innovative solution to numerous high volume generators in various industries in nearly 300 locations across the globe. This entry was posted in Environmental Concerns, Technology and the Environment and tagged BioHitech America, Eco-Safe Digester, Food Waste Reduction, Inefficient Waste Disposal, Transparency and Savings on December 10, 2014 by Lisa Giovannielli.